As you might have figured out by now, this issue finally reveals the master villain inside the can, the foe who has been breathing down Matt’s neck since Daredevil #2. I will get into full spoiler territory at the end of the post, clearly marked as such, but to make things a little less complicated, I’m actually going to start with the back-up story. How’s that for a nice twist? The back-up story is set “yesterday” and follows Foggy on an assignment to talk to some kids in the hospital who have cancer, just like him. The real attraction is Iron Man, but he has yet to show up and Foggy is stranded alone with a group of sick children, trying to think of something worthwhile to say. But just like the children who pulled Matt to safety way back in Daredevil #7, it is Foggy who is shown a new perspective and is able to gain new insight and motivation for his fight ahead. The children take Foggy on a journey through the comic book story they’re drawing, masterfully rendered by Chris Samnee in a very cool childlike style. The kids project their dreams and imagination onto the page and remind us of the importance of having heroes in our lives to inspire us. At the same time, the bigger story also deals with something Mark Waid has touched on before, the limits of the powers of superheroes and that cancer is not something that can be easily cured, even in the Marvel Universe. This is an important point to make in order to keep Foggy’s ongoing battle grounded, and also seems like a good fit for a book like Daredevil. I remember a lot of people found it difficult to buy into the concept that Milla’s drug-induced insanity couldn’t just be fixed by magic and super-science back in the day, because the story was set against the backdrop of the Marvel Universe. In fact, one might even wonder why Matt himself have made no attempts to try to restore his sight. But in order for the characters populating the Marvel Universe to remain relatable, I think there does need to be firm rules, or else the very concept of life-threatening illness, injuries and permanent impairments would be impossible to explore. The story with Foggy and the kids is incredibly moving throughout, but as a big fan of Matt and Foggy’s close friendship, it is the final three panels which hit me the hardest. This is when Foggy takes a hint from the kids (who do finally get to meet Iron Man) and reminds himself of who his own hero is. This whole story is amazing work by the whole creative team and makes me proud to be a comic book fan. Hulk may smash, Avengers may assemble and Daredevil may punch someone in the face really hard (in fact, he does just that in this issue), but at the end of the day, the best superhero stories have at least something to say about some of our most human challenges. And, speaking of challenges, let’s look at the main story which picks up right where Daredevil #25 ended. There’s an opening scene that more or less reveals who the villain is, so I’ll skip that until we get to the spoilery stuff below. Instead, we’ll join Matt back in his office bathroom, licking his wounds. Metaphorically speaking. He is interrupted by someone entering the office who says he’s there to interview for a job. Matt is immediately suspicious, and so is the reader. The amount of tension built into this entire scene is incredibly impressive in terms of both scripting and the visual storytelling which involves great pacing and nice use of Daredevil’s senses. After the night he’s been through, Matt has every reason not to take anything at face value, which also makes him liable to overreact to things. But, to quote Joseph Heller, “Just because you’re paranoid doesn’t mean they aren’t after you.” In an incredibly well-executed twist, we learn that Matt’s paranoia is warranted and “Mr. Benson” is indeed not what he seems. Chris Samnee clearly demonstrates that he’s not just able to pull off Captain-America-as-drawn-by-children, but some really chilling stuff as well. The facial expression shown below looks like something out a horror story. Matt, completely unhinged at this point, is interrupted by a phone call reminding him that he’s late for Foggy’s treatment and sets off across the city, secret identity be damned (and that’s another topic I’ll have to return to). He soon realizes that he’s being watched and, as a reader, you almost have to remind yourself to breathe. There’s a very real sense of urgency to most of what happens in this first half of the issue, and you can clearly sense Matt’s desperation. This represents an interesting take on a character who, on the one hand, is not exactly known for a perfect bill of mental health, but on the other is more likely to suffer from hubris than low self-esteem. Once Matt reaches Foggy’s bedside, you’d think the time had come for Matt (and the rest of us) to catch his breath, but his paranoia has not abated (as depicted in the panel below), and that’s most definitely a good thing in this case. When the two friends finally manage to take a few minutes to sort things out, they quickly figure out who is after Matt. And who that is (spoiler warning!) is something I’ll have to get to below. In terms of my reaction to the reveal, I will say this though: Yes, there were signs. Many of them. But the reveal was still jarring, and not in a way that was, for me, 100% positive. I actually like the choice of the villain and the concept surrounding him (yes, it’s a ‘he’), but it wasn’t a case of all the pieces of a puzzle magically coming together. It was more like sitting there looking at a puzzle with a bunch of piece left over. I’m confident that these missing pieces will be adressed in the coming issues, however. With that said, let’s move on to the details. Psst, for even more protection against spoilers, here’s yet another image to keep you safe. 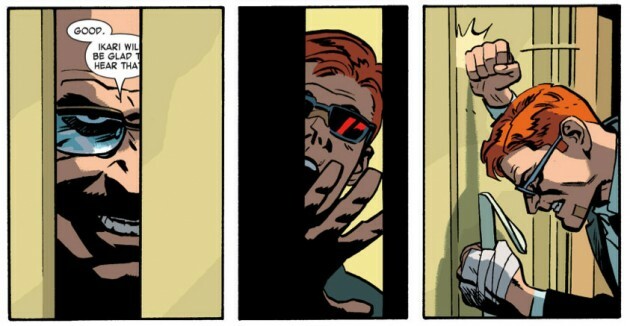 This one is from Daredevil #16, and has the added bonus of always cracking me up. If you’ve read this far and didn’t want spoilers, well you need to learn how to follow directions. If you’re still with me, I’m going to assume that you’ve read the issue and know that the mystery villain is Bullseye. This really came out of left field for me. Maybe a little too far out of left field for me to be perfectly comfortable with it, because the pieces don’t seem to really line up perfectly yet and there are still a lot of things I’m left wondering about. In a brand new interview with USA Today, Mark Waid talks about this reveal and what’s in store for Daredevil and I highly recommend that you read it. It helped me make much more sense out of this direction. In the interview, Waid talks about being flabbergasted that not more people realized who the villain and that he hadn’t hidden any clues. While this is true (I can think of many such examples from past issues), I personally dismissed Bullseye, in spite of those clues because I just didn’t feel like this kind of set-up carried Bullseye’s signature. What Waid obviously intended to be clues struck me as deliberate misdirections and red herrings since everything the villain seemed to be doing seemed so unlike anything Bullseye would do or have the capacity (and the money!) for. Before getting to what I really like about this reveal – yes, there’s plenty of that too – there’s another little thing that bugs me. The way Matt and Foggy figure this out really doesn’t offer much in terms of evidence linking everything Matt has been through specifically to Bullseye. Foggy draws circles on a paper as metaphors, but the circles themselves (eventually forming a bullseye) are really kind of arbitrary as a form of visual representation. They don’t conclusively offer any kind of proof, aside from possibly speaking to some aspect of Foggy’s (in this case) subconsious mind. Maybe that’s how this scene is supposed to be interpreted. Regardless of the details, when Matt realizes what’s going on and where to go – ably assisted by regular guest star Hank Pym, who is able to offer a location – Matt cleverly devises a plan to get out of the hospital, lose Ikari, who is on his tail, and set after his old archenemy. When he reaches his destination, we also learn that the woman who has been helping Bullseye is none other than Lady Bullseye. This actually ties in really well with the Milla subplot with which she was heavily involved during the Brubaker/Lark run. 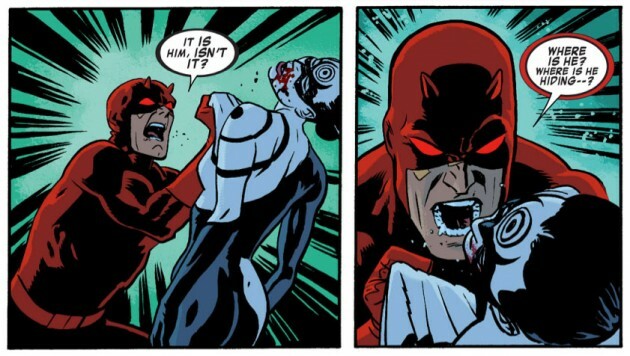 After reducing Lady Bullseye to a bloody mess in a display of shocking brutality, Daredevil finally comes face to face with Bullseye, incased in the big cocktail shaker that’s keeping him alive. This is where the story comes to a close, with Ikari approaching ominously from behind. It is a really great cliff-hanger. What I really like about this reveal, after having had a few hours to digest it, is that Waid really has managed to revamp Bullseye by turning him into a completely different kind of villain, even though I did find it a bit jarring at first. I also think many fans, myself included, can appreciate the way Waid and Samnee can incorporate earlier runs of the comic, and even touch on the many questions left unanswered after Shadowland. Just knowing the crucial role that Lady Bullseye has played in all of this makes her a more interesting character to me. And unlike her male namesake, she always seemed to be of a more scheming nature. It is also interesting to see Bullseye so completely incapacitated, even though this isn’t his first bout with paralysis. So, lots of interesting potential to explore here! Well, that was a much longer review that I’d anticipated, but there seemed to be so much to discuss, and not only because this was a double-sized issue. Minor quibbles aside, this was an amazingly dramatic and entertaining issue with perfect pacing that sets up a very interesting situation for Daredevil to deal with next issue. Kudos to all of team Daredevil, including the always amazing Javíer Rodriguez and rock star letterer Joe Caramagna who too rarely gets the credit he deserves for what his great skill adds to this book. Keep doing what you’re doing guys. Maybe it’s just me, but I’m not 100% buying it just yet. I think Bullseye’s a red herring. Never been so let down by a reveal. I wish it had just been Kingpin messing up Matt’s life again for the 20th time rather than this. By this rational any villain or criminal can become a machiavellian mastermind on the level of Kingpin, Luthor, or Osborn with enough spare time. The only way this works is if Bullseye is misdirection or being used himself by the “real” villain. The only bum note in an otherwise great issue was what you mentioned, with the way Matt/Foggy came to the conclusion that it was Bullseye. Matt just so happened to use circle of hell as a metaphor(unless I missed circles of hell was some recurring theme in earlier issues), that Foggy just so happens to draw. And hey, kinda looks like a bullseye! That was quite a leap in logic there, Nelson and Murdock! What elevates this book so often is just how smart Waid and Samnee are in it’s construction. It’s all in the little things. The way the words get cut off with the closing elevator door, a nasty little message you read(and Murdock hears) and understands just too late to do anything about it. You can FEEL his frustration. And it’s one of those things that works best in the comic book medium. then BOOM Daredevil bursts into the room, adrenaline lines pumping. Usually when a character bursts in a room like that, it’s telegraphed; you see the hero flying/swinging to the location, or perhaps a character is in danger and right before they’re hurt, dramatic entrance! Here, it blindsides you, just like it blindsides Lady Bullseye and Ikari. We had no idea how much time has passed since Ikari lost him, and their quiet conversation seemed to promise a cliffhanger. The shocking Daredevil entrance is actually shocking! It’s things like that, like the brilliant “Try the red one” reveal or the “heads in the closet” reveal from earlier issues that show the level of which Waid and Samnee are working. Waid is a guy who’s been writing these superhero things for YEARS. Decades, even. He knows all the tricks, all the cliches, he knows how to subvert them, how to lead you on for one thing, then pull the rug right under your feet. He and Samnee are making this Born Again story sing in a way it hasn’t since Mazzuchelli last drew the book. Waid’s Daredevil is as good as anything on the market today. Wow… so not Death-Stalker after all! But that doesn’t bother me too much. Because I kinda feel like… if I had been right and it had of been Death-Stalker, although I probably would have been pleased with myself for moment or two for guessing correctly, I probably wouldn’t be as INTRIGUED in the story going forward as I am now with it actually being Bullseye. On a more serious note, Foggy’s back up tale in this issue really hit home for me. As earlier this week I had learned that one of my best friends has been diagnosed with bowel cancer (which i’m still trying to process really). The way Mark Waid is managing to weave this emotional thread amongst all the super heroics, ninja beat downs and intrigue of the mystery villain, really is a testament to how great a writer he is and indeed how lucky we all are as DD fans. ..I really wasn’t expecting bullseye! and like MONTY and HNUTZ i’m still not 100% sure we have seen the real reveal. Even though I have read Mr Waids interview, there something not quite right. Bullseye wouldn’t be clever enough to replicate a radioactive chemical, would he? Anyone else notice the sequence [K]law [J]ack Murdock [I]kari suggesting the next is a [H] which i suggest can only be the Hand. That and the fact that Ikari looks like he should be in the Hand. Still if Bullseye is the main man behind all of this, I really really like the fact that he is a negative of DD, all sight and no senses.. Can barely wait for #27. Call me aboard the crazy train. I’m not at all buying that it’s Bullseye. Sure, sure, it’s going far for a fakeout, but there are a number of things that don’t sit right – although I’m coming more from the creative side of this than anything. First of all…who tells us that it’s Bullseye? Foggy. How does he find out? By drawing Matt’s “circles of hell”, and thinking, “oh hey, I made a bullseye…heywaitaminute, BULLSEYE!” And yes, it’s not at all unnatural for Matt or Foggy to make Bullseye their prime suspect on a whim, but seriously…is that how Waid would drop the big reveal? With such a lamely coincidental deduction? I’ll go ahead and say it: he’s better than that. Because here’s the thing – there was no need for that scene. It doesn’t tell Matt anything about how to find the mastermind. He gets that information from Hank Pym, and as soon as he enters the tower, he finds Lady Bullseye. That, on its own, would have been enough to give us the big reveal. To go “ta-daa, guess who’s the big bad!” But Waid made sure to put in the Foggy scene. So that Matt would enter the tower and not be surprised at Lady Bullseye being there. He had to make sure to have Foggy’s deduction, something that is just so creatively FORCED into the script, when it wasn’t needed. From a writing standpoint, the scene is BAD. Unless the objective is to plant the red herring and – like Matt – get a false confirmation that leads us storming right to the conclusion EVEN THOUGH WE DON’T HAVE A TRUE CONFIRMATION. ‘Cause also – Lady Bullseye’s appearance is so…unceremonious. Every other villain, new or returning, has been given a proper unveiling. And Waid definitely had the page count to give room to such a reveal. Lastly, and I just have to stress, it’s not Bullseye’s style. I’d be so disappointed if this is him. Not just the “working with others” thing – the convoluted planning, the scientific aspect of recreating chemicals, the extreme funding…it rings so untrue, and it would be HARD to cram an entire explanation for all that stuff into next issue’s conclusion. But if you just say, “it’s Deathstalker”, that’s way more workable. I missed the Chris Samnee AR Interview, which spelled it out weeks ago…. Either way I’m loving this whole whodunnit thing Mr Waid has created. Those last three panels. They tugged at the old heart-strings. So glad Chris Samnee is being credited as “Storyteller”. I haven’t been so impressed with the art on the series since Maleev. I loved the issue, though I thought the part where Foggy and Matt figure things out was very…odd. Here is my thought, Bullseye is the villian. I think that’s clear. How he survived, how the Hand fits in, and how he could be behind all the science stuff is still in the air. My question is who is IIkari? Just some random martial arts stud? Has anyone seen the Hand corrupted White Tiger since Shadowland? Could Ikari be a woman? White Tiger is an unsung failure/issue Matt still has out there..
Wow, this is really good writing for Waid. Murdock’s aggressiveness as of late from after he was possessed by the Beast to now is so believable and powerful. What was done to Bullseye is also ingenious. And now the twist for Klaw. Bet its someone close to Murdock who he once thought dead but is alive, somehow resurrected by the hand.